Teresa’s favorite tool is my second favorite. The tool that goes with me everywhere in the garden is my trusty, multi-purpose perennial knife. It plants bulbs, busts up soil, renews the edge on a garden and weeds with a vengeance. My first one had a wood handle, but I found that a brown tool in a garden equals a lost tool in the garden. All new perennial knives sport an orange plastic handle, and two of my three wood-handled knives now are wrapped with colored duct tape. 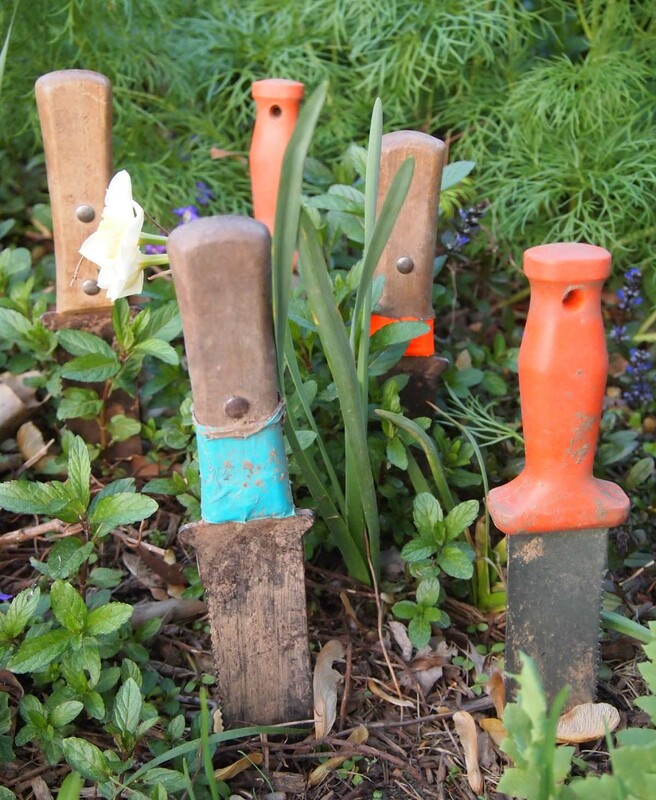 In total, I have six perennial knives; three wood, three orange. You are probably wondering why? Our children had to have their own perennial knives. And, when I lost a knife in the garden, I ordered a replacement. Then the lost knives reappeared. There are only five well-loved and well-used knives in the picture. Time to go hunting.